Counting The Beat: Sorry, What's Your Name Again? Sorry, What's Your Name Again? It must be hard to come with a band name. Anything half decent has probably already been used. So, it's no suprise that there are some pretty unusual bands names out there. More by accident than design this episode features bands with strange names. For more unusually named kiwi bands check out the list put together by Paul at Pure NZ Alt Radio. A few years back, well ten years actually, I picked up a crazy album called Low Tech Bent by an outfit called Spazmatron. The "band" was actually one guy from Whangarei, Brendon White, although his brother Darren played the drums on the album. In fact those drums dominate the album - they're right up front with Brendon's sequencing and electronic sounds sitting behind. That album is long out of print but a few years later Spazmatron released a bunch of songs that saw the duo add vocals to the drums and synth sounds and play around with a bunch of musical genres. Those songs are available on Amplifier with the standout probably being the jokey country track 'Good Ole Boy'. There's an outstanding animated video for that song on the video page. 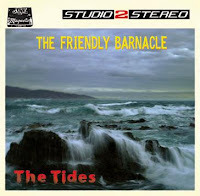 Friendly Barnacle is the moniker of Phoenix Foundation bass player Warner Emery's band. Like bandmates Samuel Flynn Scott and Luke Buda he has put out his own album The Tides. While, perhaps understandably, it's not as strong as the efforts of his band-mates who write most of the songs and front the band this album will be welcomed by any Phoenix Foundation fan, or, for that matter, fans of mid 8os Flying Nun pop or those just digging the Wellington indie scene. I recently picked up a great little release by Auckland band Superturtle. The band started off as the solo project of Darren McShane who has previously played with Chainsaw Masochist and Figure 60. For the album Superturtle To The Rescue McShane has pulled in a number of other musicians to help hom on a track by track basis. I actually bought this solely because of the packaging. The CD album comes as a "bonus" with a 7"single of 'All Our Friends' b/w 'Never Came Back' presented in a gatefold sleeve with retro liner notes. And all for only $12.50. Luckily when I got it home the music was pretty good too - clever guitar led pop augmented with horns, organ and more. This deserves a wider audience than it will proabably get. Videos for both sides of the 7 inch are on the video page. I few episodes back I ran a special on songs about UFOs that featured a song called UFO by a defunct Gisborne band TK421. A former member of the band, Res, contacted me to let me know what he had been up to since. It turns out that TK421 have been hanging out in Gizzie listening to a lot of The Ramones by the sound of it. They have now morphed into The Rocket Jocks and have released an EP called Next Stop; Moon! I was pleased that they have retained the science fiction interests of their former band - not only with the EP title but also the tracks 'Invasion of The Giant Ants' and 'Judy Jetson, I Love You So'.